This is looking down the aisle from the top of the 100 level section. As you can guess from the beginnings of the infield construction, this was taken from a spot about lined up with the pitcher's mound on the first base side. 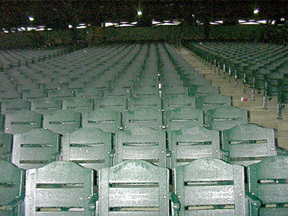 This is looking up from the second row to where the first photo was taken from. As you can see, there is no aisle through the middle of the first section which should make for more baseball and less crowd distraction. 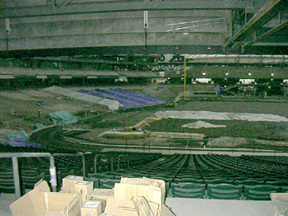 This is looking from the second row over the sunken Mariner dugout. They are just starting to work on the infield. The bottom of the 100 section is barely above the level of the field. 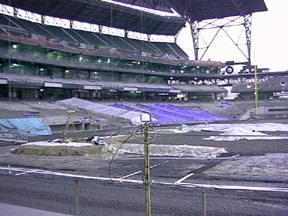 The view is going to be much improved from the Kingdome.